Rating: More reggae excellence from the Nice Up! Records label here as Blend Mishkin releases his new album backed by six-piece band Roots Evolution. 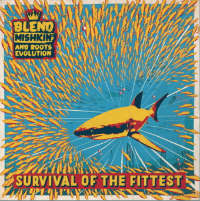 Survival Of The Fittest also finds the Athenian producer (and head of the Cast-A-Blast label) teaming up with a veritable army of vocalists on all but two of the eleven tracks contained therein – an army that includes Gappy Ranks, Mandinka Warrior, Georges Perin and BnC. 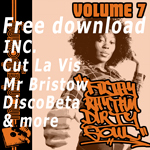 The recipe is simple: nine uplifting heavyweight vocal reggae cuts plus instro dubs of two of them with one foot in the past and the other one firmly in the present. Among the best cuts are the pairing of Skarra Mucci and Mandinka Warrior on the opening boom of Original and Some Boy Can’t Chat where KG Man’s hook ensures this one has all the makings of a future bashment classic. There’s also Chica Fresa which rides a lively beat and features Spanish-language vocals from Don Caramelo (if you like your dancehall with a dash of latin) and (while he brings a touch of soul to two tracks on this) it’s Georges Perin’s falsetto turn alongside Mandinka Warrior on the laid back summer vibes of Daddy Let’s Slide that takes the laurels. Perhaps topping even these though, is a saucy, Dawn Penn-sampling number featuring another inspired pairing in the form of Jammaroots and BnC – Baby Got Me Good. Or, as you’ll discover when you’ve heard this – Blend got you good.